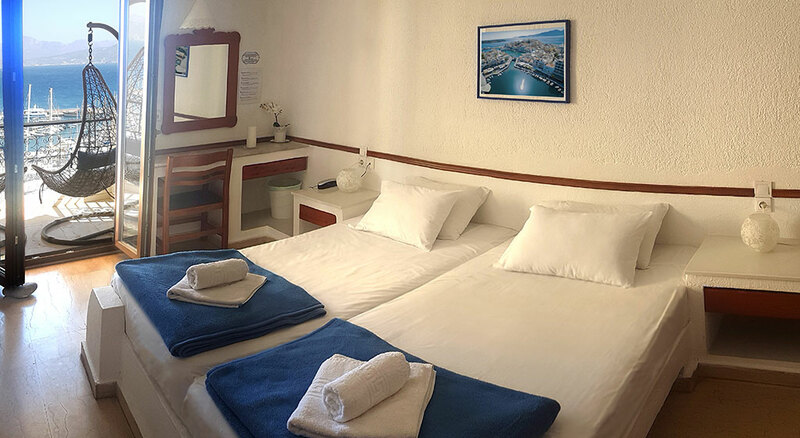 Mantraki Hotel Apartments (fully furnished Hotel Apartments of 3 stars) is operating by the licence of EOT (Greek Tourism Organization). Agios Nikolaos with its exceptional climatic conditions, offers a temperate climate with a mild winter. This was our fourth visit to our great friends Maria and Costas. They are the most friendly, helpful and honest people you could hope to meet. Their hospitality is second to none. I cannot praise these two people highly enough, also thier daughter Leontini when she sometimes is helping them out. 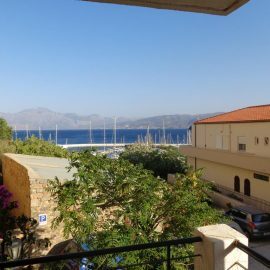 Agios Nikolaos is a great place to stay, with many interesting places only a short drive away. The town is very hilly and the hotel is on a hill. The nearby lake is very famous and two small beaches are only a short walk away. 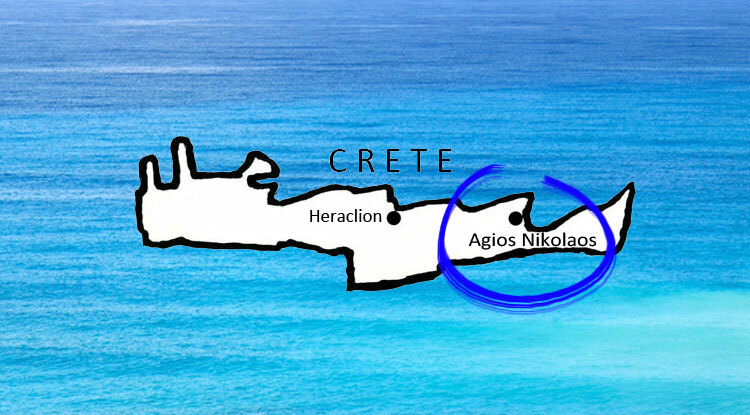 The rooms are self catering, but there are many good tavernas close by. There is a small lift if you don't want to use the stairs. We were in 404, with great views of the nearby marina and mountains. We went for Easter but the better months are May, September and October, and June to August if you like it hot. We really enjoyed our stay with Maria and Costas. We had welcome drinks, and lots of advice on what to see in the general area. We stayed for 4 nights in early May and enjoyed the spacious, cozy environment. 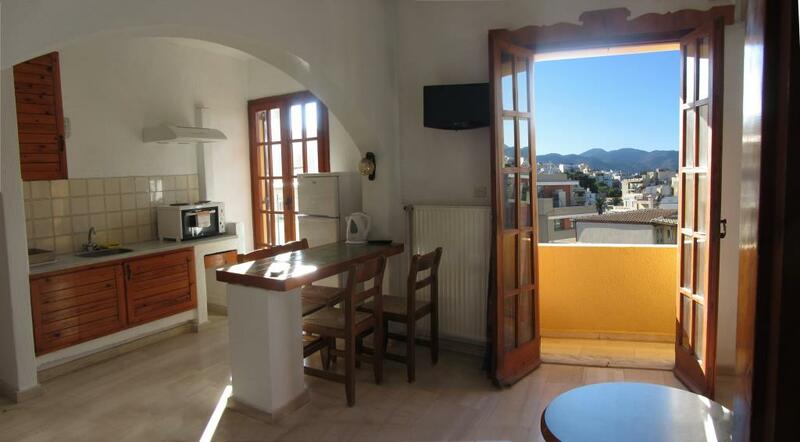 Proximity to everything made for lovely walks to the beach, harbour, sea walk, restaurants and lots of shopping. The fully equipped kitchen made it possible to make our mini meals, and the balcony was lovely to relax with a book, cup of tea and look out to the harbour and sea. What a beautiful area of Crete, Greece and the world! We would love to go back. 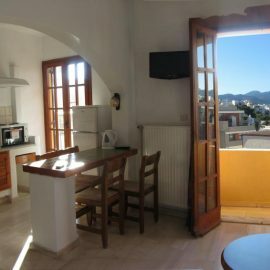 Agios Nikolaos is a beautiful area of Crete and the Mantraki Apartments - owned by the charming Maria and Costas - make an excellent base from which to enjoy all it has to offer. 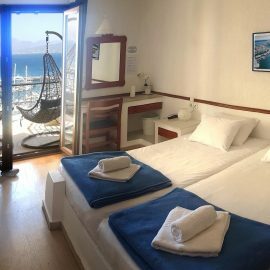 The building and apartments are decorated in traditional Cretan style with great attention to detail - and special emphasis on the sea! 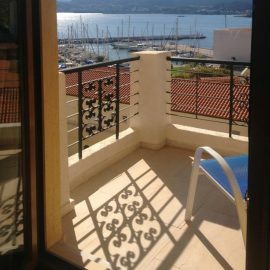 The apartments are in a quiet area but very centrally situated - 2 minutes walk to the beach in one direction and two minutes to the town centre, lake, port, shops and restaurants in the other. The 'superior' apartments are bright and airy with long balconies and swing chairs. We enjoyed lounging there so much that we bought 2 identical chairs immediately we came home, unfortunately lacking the beautiful marina view. The kitchen area is equipped with all the essentials, the air conditioning and Wi-Fi are efficient, and the whole place is kept impeccably clean and tidy. Highly recommended for a traditionally hospitable Cretan experience.